This book is a confirmation of most of what I believe to be true concerning the Biblical story of Abraham and Sarah; his child by Hagar, Ishmael; and thier banishment at Sarahs' insistance. This ignited a whole series of events that we all understand to have led to the creation of 3 Religions- all laying claim to the same Patriach-Abraham. At the heart of the "Arab-Israeli" question has always been the dispute over who received Gods' mercy, or who should have? The first born son of Abraham with his hand maiden Hagar-Ishmael; or should it have been Isaac; his first born by his marraige to Sarah? Our cultural and social moors were set by this story and are almost "etched in stone" so to speak. And culminating with the creation of Islam in 625 AD we have been at odds since. Christian against Jew and Islamic versus everyone. Ms. Gordon with her careful analysis of this Biblical story shows us the difference in the roles of women in Judeo-Christian tradition since Sarah and juxtoposes it against the same issues in the Islamic world. The social diffences and political ramifications lead to a polarized current based on this one story. And the more firmly entrenched we become in each of our respective versions of this story, the further the polarization becomes. 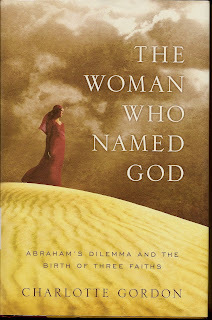 This book tackles the issues of the role of women in the oppossing cultures, and how it all affects us today. That it does so in a style that is at once easy to read, yet preserves the historical context and insights of the subject, is a feat in itself. At the same time the author steers you to a new understanding of what may have taken place on Mt. Moriah so long ago. This will be a controversial read for some, and an exciting journey for others. The important thing to remember is when you read a book like this you are getting another piece of the puzzle that has been the center of literary and philosphical argument for thousands of years. With my own understanding of the Bible and it's history somewhat limited I found this book to be full of stuff I did not know. What is the Islamic version of this event? Where did it occur? How old was Isaac at the time? Did Abraham visit his illegitimate first born, Ishmael? What happened to the relationship between Abraham and Isaac after the trip to the mountain? And how did that affect the history of the Mid East? And how does all this affect us right down to the present day? You may come away with more questions than answers- and either you will have gained some insight into your own doubts- or reinforced your previous convictions. And of course the third possibility is that these challenges to the conventional "take" on this subject will lead you to try and know more.